Vinegar is a dilute acetic acid solution that has many household uses. It can be used in cooking as well as to heal wounds and treat diseases and infections; it can also stop a cat from scratching furniture. One of the most famous things it is used for is to reduce the pain of a jellyfish sting. Applying vinegar to the sting deactivates the nematocysts, the cells that inject the venom that the jellyfish produces, though it is better to use hot water because the venom is also deactivated by heat. When using the vinegar method you need to be careful because if the sting is from a Portuguese man o' war, which are not true jellyfish, the vinegar can cause their nematocysts to discharge their venom, making the sting much more painful. 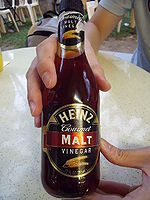 Vinegar's primary component is acetic acid, containing roughly 5% acetic acid by volume. The systematic chemical name for acetic acid is ethanoic acid, meaning that vinegar, made up of mostly acetic acid, comes from the oxidation or fermentation of ethanol. Vinegar has one carbon atom surrounded by three hydrogen atoms with a second carbon atom has one oxygen atom and an oxygen with a hydrogen attached. The chemical formula for vinegar is CH3COOH. Other than just acetic acid, vinegar is made up of water, and some other coloring chemicals. The properties of vinegar also depend on what kind or flavor you use. The etiology, or origin, of vinegar comes from the French word vin aigre meaning "sour wine". As previously mentioned, vinegar comes from the fermentation of ethanol, thus incorporating the meaning of vinegar. This oxidation or fermentation process can be done one of two ways. The first way, requiring machinery, is quicker, taking anywhere from a couple hours to just a few days. The second way of fermentation is the natural way, with no equipment required. This natural process can take anywhere from a couple of weeks to a couple of months. Through this process of oxidation, a non-toxic slime called the mother of vinegar forms. Mother of vinegar is composed of cellulose and acetic acid bacteria. Mother of vinegar is sold in stores, and is even sometimes consumed despite its very unappetizing look. Another one of the more disgusting parts of the fermentation of vinegar is the use of nematodes. These free living creatures, also sometimes referred to as vinegar eels, feed on the mother of vinegar, and though not harmful to humans are removed before the vinegar is bottled by the manufacturer. The main ingredient in apple cider vinegar, possibly despite popular belief, is not apples, but rather the same in vinegar, acetic acid. Apple cider vinegar is made with pulverized apples and also includes amino acids, sugars, and other vitamins. Apple cider vinegar is a folk remedy which became popular in the U.S in the 1950's when it was promoted by the best selling book Folk Medicine: A Vermont Doctor's Guide to Good Health by D. C. Jarvis. On the back of supplement boxes or anywhere on the internet, it is claimed that vinegar can cure head lice, reverse aging, ease digestion, and wash "toxins" from the body. Though none of these have evidence to back them up, some uses, like curing head lice, have been studied but nothing has turned up to support the claims. Others claim that they may do these things, but not as well as other treatments. For instance, vinegar can be used as a disinfectant, yet common cleaners can do the job better. And vinegar on jellyfish stings does work, but hot water seems to do the trick better. People in the South buy and use more vinegar than any other region in the world. When you mix vinegar and baking soda it creates carbon dioxide. This is used in schools, to make a do-it-yourself erupting volcano. Pearls melt in distilled white vinegar. Eggs soften in vinegar,because, the acetic acid dissolves the calcium in the shell. If you soak a chicken bone in vinegar it becomes rubbery. Vinegar removes the smell of paint. Vinegar is used to make salad dressings, sauces, marinades, ketchup, mustard, and pickles. 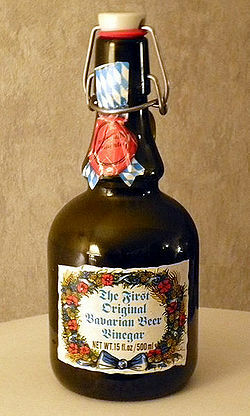 Germany, Austria and the Netherlands all use beer to make vinegar. Italy and France make a very rare vinegar made with honey. If you soak your foot in vinegar it helps cure athletes foot. Drinking a teaspoon of vinegar can stop the hiccups. Vinegar can make dandruff go away if rubbed into your scalp. To stop a cat from scratching furniture, rub vinegar on it (the furniture, not the cat). ↑ Nomura JT, Sato RL, Ahern RM, Snow JL, Kuwaye TT, Yamamoto LG; PubMed.gov,accessed 5-22-11. ↑ -Vinegar Tips Unknown author, Mizkan Americas inc, accessed 5-20-2011. This page was last modified on 21 March 2014, at 14:19.